Today’s post continues our recent discussion of some different approaches to building wet paint effects. Today’s post takes a look at a paint preset that simulates painting on top of a wet paper towel. This produces a very soft diffuse wet colored paint backing effect. Yesterday we talked about how to use a special brush type called Geodesic Source Brush to build a spreading wet paint preset designed for manual painting. Today, we’ll focus on a auto-paint effect that simulates applying paint to a wet paper towel. We’ll just be using a normal Source Brush type for today’s wet effect (as configured in the Brush Type control panel shown below). 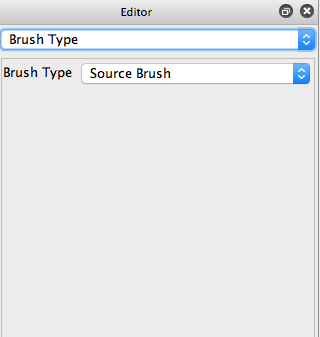 The Source Brush type generates paint nibs directly from the Brush Source control panel settings. To simulate the textured surface of a rough paper towel, I used the Background Texture control panel is conjunction with the Lum Modulation parameter feature in the Brush Modulation control panel (2nd gallery image above). Turning on Lum Modulation allows the generated brush source image to be dynamically modulated based on the Lum Mod Tex Src and Lum Mod Option parameters. 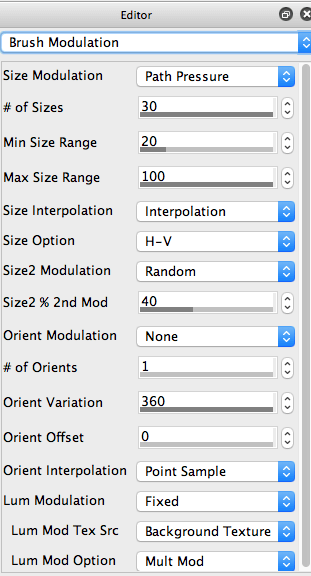 I setup these parameters to apply a Fixed brush luminance modulation based on modulating with a Background Texture source, and a Mult Mod modulation option. So the background texture and the current brush source image are multiplied together before building a paint nib. I’m using this brush source luminance modulation to add a paper texturing to the paint effect. So I needed to configure the Background Texture control panel (3rd gallery image above) to build a reasonable simulation of a rough paper towel surface texture. Note that I set the Orient Mod parameter to Fixed, and the Tracking parameter to Global. And I turned Off the Random Start parameter. I did this because I wanted to simulate a flat textured surface. The Background Texture generator is extremely flexible. You can use it to simulate texturing within a paint nib, or texturing within a bristle smeared paint path, or to simulate flat textured surfaces (like we are doing here). If you are simulating texturing in the brush nib, you always want the texturing to be different. And if you are simulating texturing caused by brush bristles smearing along a paint path, then you want the texture orientation to track the current path. The fixed global texture orientation tracking setup described above is what you need if you want to simulate a flat continuous fixed textured surface. In yesterday’s post, we configured the Paint Fill Apply control panel to use a dual fill apply / brush displace algorithm, where the geodesic brush type spread distance from the original paint path was used to modulate the fill algorithm. So the center of the paint path was generated with the apply fill algorithm and the edges of the painted path were filled with the brush displace fill algorithm (which generates a wet water smear effect). Today’s Paint Fill Apply control panel (4th gallery image above) is configured to use the Mix Apply / Brush Expand dual fill algorithm option for the Fill Algorithm parameter. 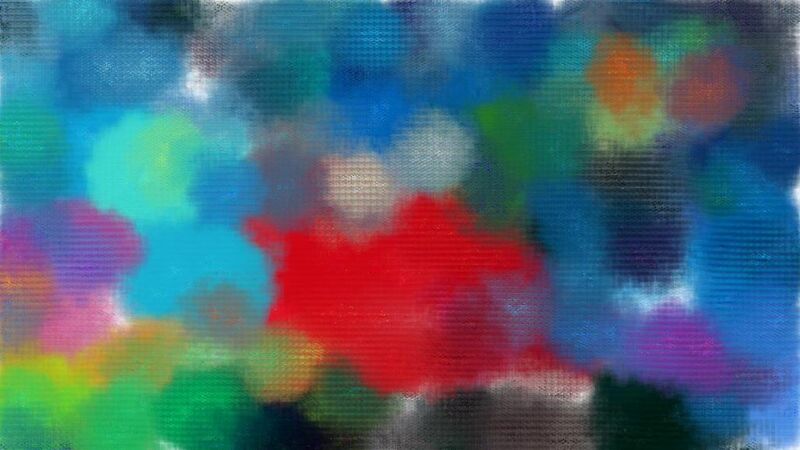 Note that unlike yesterday’s paint preset, the Mix Apply Option parameter is set to Normal. So the dual fill switching back and forth between the 2 fill algorithms is based on the normal sequential application of the individual paint nibs along the paint path. 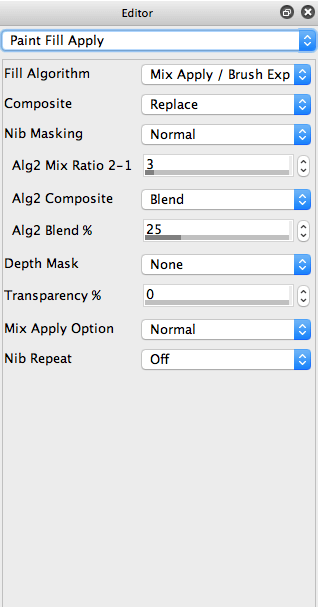 The Alg2 Mix Ratio 2-1 parameter is set to 3, which means that after a paint nib applies paint to the canvas to the canvas the next 3 paint nibs will brush displace. The wet paper towel paint preset discussed in this post is available for download Wetpapertowel It generates a very diffuse wet soft paint effect. So you typically might use it in conjunction with other paint presets or effects to build a final finished visual art effect. Here’s a simple example above, where a second Bamboo Sketch paint preset was applied after the initial wet paper towel paint effect pass to add some additional source detail sketch on top of the initial soft wet paper towel textured paint backing.